Lilac silicate of difficult composition (Ca,K,Na) 3 Si4O10 (OH,F) H2O. Tonkovoloknistye aggregates. In acids does not dissolve. Solidity 6-7. The first finds of Charoite behave to 1949, when V.Ditmar took this stone for the variety of worm-pipes. In 1978 in the deaf Siberian taiga of Yakutia on the route of BAM, ashore the very cold stormy small river of Cup the deposit of semiprecious stone which by name the rivers got the name of Charoite was found. It is a deposit while unique in the world and it is practically mined-out to today. In other countries yet not found out his beds. There indeed is something bewitching in the lilac stone of Yakutia, bewitching, changeable, the blue-purple, violet streams of cold Cup, which curl, were reflected as though in him, overflowing, as lifting from the bottom of gold of silt. A color varies from light-violet to dark, very beautiful tints with silky iridescentness. Silky brilliance has a semiprecious stone, slender colouring from inconspicuous- to darkly-violet, often with the star-shaped including - honey-yellow or rifle-green. Distinguish more than 100 varieties of Charoite, which are unlike on each other with the wide gamut of violet tones, from sharp ink to the most tender tints of violet. 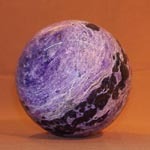 His fine-fibre structure comes to light at the polish of Charoite, which gives a beautiful overflowing pattern from the veins of different color. There are even stone with the effect of cat's-eye. 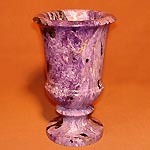 For Charoite radiant and star-shaped excretions of minerals are characteristic. 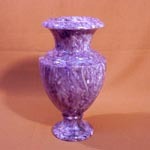 It is set that reason of the lilac colouring of Charoite is caused the admixture of manganese. The rose and cherry colouring arises up at equal maintenances of manganese and iron Fe. Brown tones in colouring of Charoite from the admixture of trivalent iron Fe, and dark blue - from the admixture of titan, when it exceeds maintenances of manganese and iron Fe. 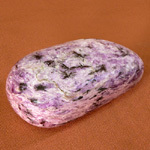 In Charoite rocks present aegirine, tinacsite, Microcline, Quartz and other minerals. To the present tense in them found out more than 30 unique and rare minerals, and also native metals are gold, silver, copper and minerals of platinum. 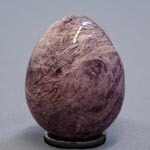 Stone differs a fine-fibre structure, and at a polish plates and cabochon on him a beautiful pattern comes to light from the thin, meetings with each other streams of different lilac and violet tints. A mineral forms fine-fibre casebound aggregates, due to what he is characterized enough high durability and viscidity. Along with dense fine-crystalline differences there are his long-staple excretions (measuring to 10 sm), sometimes fan-shaped going away, like a sun. Large fibred educations on occasion irisation in blue tones. Brilliance is glass with a silky ebb, especially at fibred varieties. 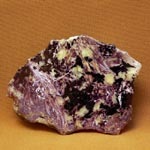 The structure of Charoite rock is very original are trickles of violet Charoite, bent, inclusion rounded seams flow around semilucent milky-white quartz and feldspar; inclusion aegirine of rifle-green (to black) color and honey-yellow tinacsite contrast with a basic violet background and give a stone the special beauty. A silky ebb creates the as though overflowing, streaming colouring. 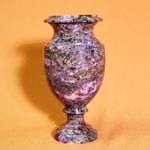 This unusual stone with the mother-of-pearl and silky flowings found application as jeweller and valuable carpentry. 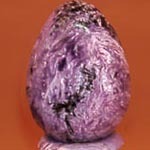 The unique deposit of Charoite is practically scooped out for today, therefore stone rises in a price swiftly, grows in a price and is already at the level of gemstones color stones. Moreover, rising in the price of Charoite will be observed and further. 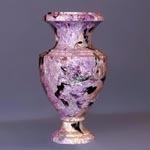 The dearest stone have thick lilac or violet color with the beautiful black including. 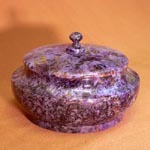 Physical features of natural Charoite. This mineral contains radio-active components often, sometimes in great numbers (intensively-painted standards and standards with the abundant black including). From point of physics of crystals, correct and safe from point of level of radiation (to 19-24 milli-Roentgen/hour) there are natural Charoite of shallow and small size, without the abundant black including, thin - they are painted the negligible quantity of natural connections of radio-active elements or contain them in two-bits. It museum mineral. 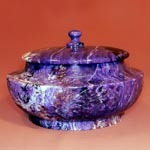 If Charoite is painted intensively or have large sizes and plenty of the black including, probability is high that it causes the enhanceable natural level of radiation of natural Charoite (from 29-32 milli-Roentgen/hour and higher) - them it is categorically forbidden to keep in home collections, expose to the serial and industrial cutting (especially in shopfloors, where plenty of personnel works). Them it is categorically forbidden to expose to the rays and ennoble in nuclear reactors and transport in great numbers (totally from 29-32 milli-Roentgen/hour and higher). Transportation of radio-active stone is forbidden without the sign of "radiation" and without additional declaration on a custom ("radio-active"), especially wholesale and much. Safely to carry shallow natural Charoite without depending on their form on hands (in rings and bracelet -"wristlet") and on feet - as possible farther from a thyroid, birth-marks, large birth-marks (especially protuberant), from a breast, superficial lymphatic knots etc. the objects easily struck a radiation on the body of people. 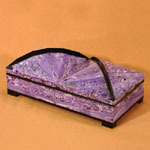 In any case from considering of safety and ecofriendlyness it is not recommended to carry large and black natural Charoite constantly and to hold in an apartment or working cabinet the large standards of this mineral with plenty of the intensive in color including (a house, closet and apartment, is a not mineralogical museum with the possible level of radiation from 32 to 120 milli-Roentgen/hour and higher for the special exposition of stone and mineralogical special stone archives). Dangerous is a direct contact with a body and carrying on the body of point and diffuse sources of radiation and radio-active components (an about 50% radiation is taken in at a contact with the external surface of body and an about 100% radiation - at a reception into a radio-active or infected object). 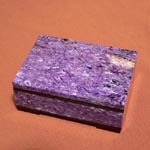 On Charoite can be very alike lilac opaque Fluorite (by an array), therefore all of doubts in visual diagnostics of this stone are interpreted in behalf on the obligatory measuring of level of radiation of doubtful mineralogical standard a regular dosimeter and his additional verification from the side of specialists. 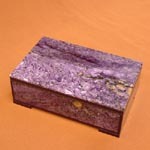 Charoite is able to take off accumulating for a day excitation for people. 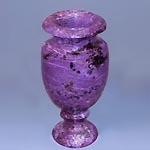 The sedative affecting human psyche renders violet colouring of this semiprecious stone. Stone of charm. Harmonizes marriage relations. 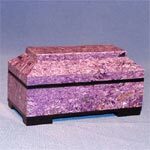 Charoite - it philosophical, contemplative stone, stone meditations. Stone of heartfelt cleanness, prudence. It teaches absolute love, breadth, understanding and reception, gives feelings of unity with all of pure. Instrumental in our spiritual development and realized life, wakes up intuition. Stone is very energy, talisman of people, aspiring to artistic creation, self-expression exactly in beauty, but not only external, and and internal. It enables a people to correct foremost itself, but after it will help to correct and organize processes in the nearest surroundings. Powerful amulet charm talisman becomes for domestic Charoite, not allowing to get to the house to the enemies, rival in love and other ill-wishers. 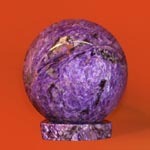 For this good from Charoite must be on-the-spot. 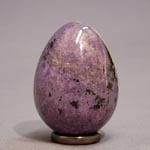 The amulet of success, Charoite helps proof to maintain unforeseen situations, proceeds in the relations of people, clamps them and stands on the guard of prosperity of not only owner but also those, who it would be desirable to take under defence. Charoite loves the people of responsive, aspiring to help and barrier, protect and send, protect from adversities and extend possibilities of near. It is a powerful talisman of unselfish.